Cantiere Navale Visentini has launched MARIE CURIE, the second LNG ro-pax for Baleària. Practically all of its structure has been completed. At present 50% of the construction has been exceeded. In addition, both engines and LNG tanks and main equipment are already on board. 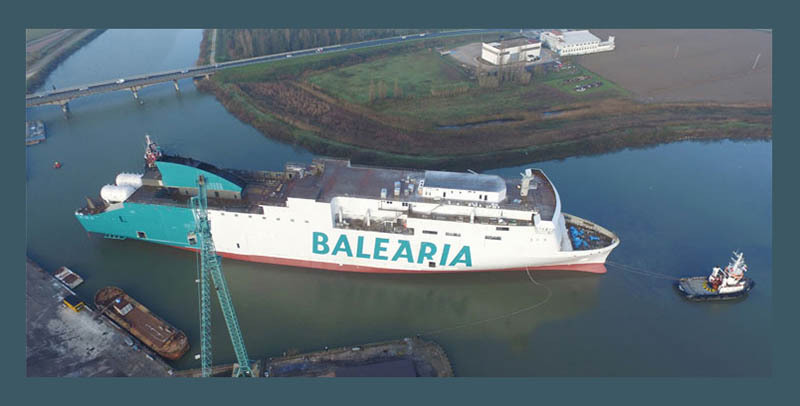 HYPATÍA DE ALEJANDRÍA will start operating at the beginning of next year, and the MARIE CURIE a few months later. The Madeira Legislative Assembly is asking the Portuguese Government for a ro-pax service between Lisbon and Funchal, throughout the year, and not only in summer.